Microwave ovens have become a staple in foodservice. Although they’re not great for the initial cooking process, when it comes to heating or defrosting certain types of food, they’re easier to use, do the job quicker, and consume much less energy when compared to conventional ovens. 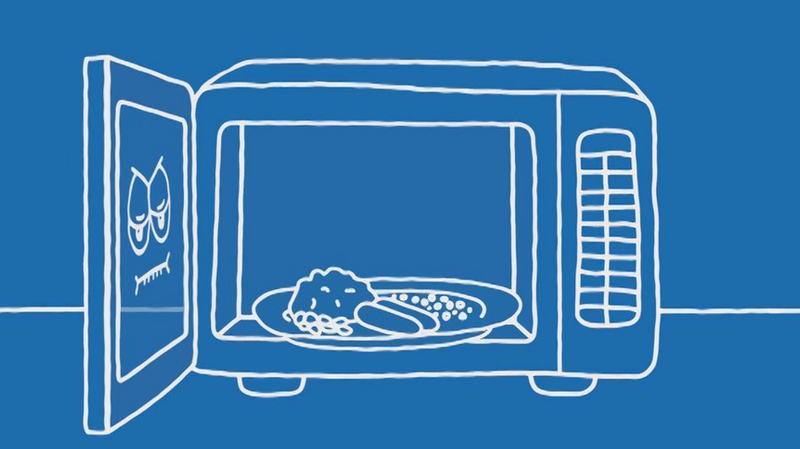 On a typical day, a heavy-duty microwave oven is used dozens of times in very short cycles: put the plate in, select the program, wait for the beep, take it out. In fact, they make life so easy in a commercial kitchen that we may lose sight of their downside. With microwave ovens, food spattering happens often, and their internal cavities can be surprisingly hard to clean. That’s especially true for three areas: the roof, where stirrer liners often have uneven surfaces and corners where food can get trapped; underneath the base; and through the lens light cover. 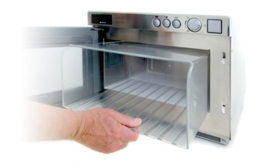 Food residues in a microwave oven can quickly become a problem. For example, they may stick to the roof and drop down onto the next plate. Or they can dry and then carbonize, becoming even harder to remove, causing sparks, and even damaging the oven. Finally, unclean microwaves can result in HACCP compliance issues, inconvenient downtime, and costly repairs. Microsave is a simple and effective way to keep microwaves spotlessly clean and avoid those problems. It’s a liner that fits perfectly inside the microwave oven and creates a barrier between the food and the interior walls. Whenever food spatters, ceiling plates touch the roof, or base plates break, the internal cavity of the microwave will remain untouched, preventing HACCP issues and damages. Cleaning Microsave is as easy as using a microwave. At the end of each session, you can simply remove it, wash it, and slide it back in. It’s made of transparent rigid TPX, a food-grade NSF International-approved polymer used in medical and lab equipment for sterilization. Microwaves pass directly through it, which means you can keep the same program settings and cooking times. Microsave has a patented design and is made in the UK by Cavity Protection Systems. It’s compatible with Panasonic, Daewoo, and Sharp compact ranges of heavy-duty commercial microwaves. To see how easy Microsave can be, schedule some time with High Sabatino so we can demonstrate all the benefits of this simple yet effective solution.